Industrial blenders can be generally defined as blenders which are well designed and constructed for daily use in industry. They should be safe to work around, easy to clean, simple to maintain, and they certainly need to be reliable. If the correct type of blender has been chosen for its intended use, that blender will be fast and efficient in the production of the finished material it produces. Production or engineering staff with less experience using industrial blenders may erroneously think that just because a machine mixes items together, it is good enough. This conclusion can be dangerously short of an accurate one. Every style of industrial blender on the market today is there for a reason. Some styles such as a ribbon blender are very common and can be used for many many types of products. However, they may not be the most efficient. Others for example like a cone blender, may have a lower initial cost, but are more expensive to use per pound of finished product. A rotary blender may cost more to purchase but offer very unique features specific to an end product. Getting the correct blender with all the current technology for your application is the key to making a good long term investment. Another very important point not to overlook is the fact that you generally get what you pay for. Many blenders are produced by large manufacturing companies who specialize in manufacturing large quantities of blenders. Some too are made by small fab shops who can make just about anything from steel and they believe they can make a blender. What many people do not realize is that there is advanced technology required in manufacturing a quality blender. It is not just about cost or bending steel. Professional shops, such as AIM Blending Technologies, Inc. spend time and money in researching ways to improve blend time and quality. They have engineering teams who go into the field and study old and new blenders. They change and modify their designs to keep current with improved sanitation, safety, and good maintenance practices. You don't get those advantages and that kind of knowledge from a local fabricator who has built an occasional blender in the past. His machine may be less expensive on the initial investment, but you will be paying for that difference in performance over the full lifetime of the machine. Be very wary of purchasing a used blender from an auction or used equipment dealer. These machines are of course sold as is, where is, and how is. Most are not suitable for immediate installation and will require modification and upgrades, if indeed those upgrades are even available for that machine. Since additional shipping, installation and other expenses are the same if the blender is new or used, many times a company will spend nearly as much converting a used blender to work for them, as they would have spent purchasing a new one; where the type of blender was selected exactly for their application and the machine was engineered and constructed to make their operation faster, safer, and efficient. All of this says nothing about the advantage of starting out with everything on the machine being new, under full warranty, with free consulting and assistance from the manufacturer. The less experience you have with blenders, the more important and critical this assistance will be. Small job shops and used equipment dealers just don't have this ability and in fact do not even offer it. Please take a few minutes and review our web site. AIM Blending Technologies, Inc. manufactures a wide variety of industrial mixer equipment from a 1 cu ft lab or test model up to a 1,000 cu ft size. The horsepowers used to drive our equipment can run up to 150 HP, and each machine is sized and constructed depending on the bulk density and special features of the customer's product. AIM has constructed a blending tower standing nearly 40 feet high which held surge bins, scale hopper, dust collection system, and a very large blender. We have also designed a system for a customer to re-constitute a full bulk railroad car load of product back to its original consistency after it stratified during transit. 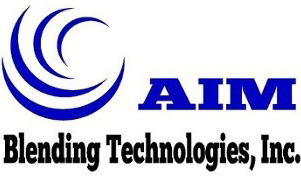 Advanced technology is what AIM Blending Technologies, Inc. is all about. Make it work for you! If you have an industrial application and your customers are depending on your company to produce a professionally blended product, you owe it to yourself and your customers to ask for professional assistance in selecting the correct blender for your application. To start this process only costs a phone call or filling out the email inquiry form below. Get a knowledgeable team working on your side. AIM Blending Technologies, Inc. offers a written guarantee which states that AIM offers more industrial mixers and other machines for the investment dollar than any manufacturer in the world. You can certainly purchase lower cost machines, but buyers who are looking for a blender with quality design and construction will see that AIM packs more quality features and superior craftsmanship into its machines than anyone at a comparable price. AIM's philosophy is all about giving you the most value for your investment dollar. AIM Blending Technologies, Inc. produced the showroom blenders for two of the nation's largest nutraceutical manufacturers. Each company selected a 350 cu ft blender for their showroom. One company chose a low bacteria/mirror finish on both the inside and outside of the blender, including the frame and motor mount. Both companies are exceptionally proud of their real live production showrooms and use them for their customer tours.